Launching a successful Google AdWords campaign requires a lot of testing and tracking. Testing is very often overlooked and considered unnecessary, when in fact it’s what makes all the difference, and allows you to move forward and get results. Many how-to guides and ebooks can give you guidance on how to create the best performing PPC campaigns, but remember that beyond general tips, no one can actually give you a magic formula for creating ads that work, every company and challenge is different. You have to test and track results to see the real performance of your PPC campaigns. While doing so, you need to know what to track, what your goals are, and how to identify and track the results, otherwise all this testing will lead you astray. Let’s be honest, we all know you need to achieve statistical significance in order to make a decision, and it takes time to gather a significant amount of data in order to make an informed decision. But, many times, we all rush into a split test without really identifying the goals and/or we’re eager to choose a winner without actually achieving statistical significance. This extremely short and rushed testing will not only give inconclusive results, but may lead you down the wrong path and making a decision by choosing an ad as a “better performer”, that really isn’t. Instead of questioning your decision or rushing to a decision, take the right steps and make an informed decision based on data that really matters. In order to make smart decisions, give each ad a fair amount of time to run and really analyze your test so you can realistically evaluate which ad truly performs better. If you are serious about testing on Google Ads, you should focus on beating your best performing ad’s CTR, conversion rate, and CPA/ROAS on an ongoing basis. Unfortunately, by default Google will display the ads with highest monitored CTR, but in order to achieve your goal and properly test all ads, you need to give them the same amount of exposure. You can easily change Google’s default setting, and instead of allowing it to “Optimize”, you will change your campaign settings to “Rotate: show ads more evenly”. Simple as that. There’s nothing wrong with wanting to advertise on Google Search results as well as the Display Network. But, make sure you are doing these in in separate campaigns for each network, especially when performing tests. Mainly, because clicks from each network are treated as different traffic sources, and second, because people are in a different state of mind and different stage of the buying process depending on where they were (Search/Display) when they saw your ad and clicked on it. If you group Search Network traffic and Display Network into one campaign and show them identical ads, you risk getting distorted data which will make it a harder to determine which ads are more profitable. Keep the networks separate in order to measure things accurately. Depending on your preference, Search/Display Network, choose the correct settings and only one network per campaign. 4. Are your clicks and conversions actually generating revenue? Another thing to keep an eye on is tracking the revenue your conversions are generating. Nothing can be worse than generating a bunch of empty clicks that aren’t turning into customers, or would never lead to a conversion. Many times, you can get into a trap of focusing on generating as many clicks as possible or seeing a high CTR (Click-Through Rate), which, kudos to you, means your copy and creative is top notch. The thing to think about is, are you actually guiding people to a path of conversion or just clicks eating away at your budget. What you should be tracking is ROAS (Return on Ad Spend) OR CPA. Focusing on what those ad dollars are returning for you is ever more important than how many clicks you can generate. Thinking about the entire customer journey and funnel is just as important as the ads you’re running. Making sure you’re targeting the right people with the right intent, who will actually convert into a purchase is really how you should be thinking about it. Once you do this, you’re definitely on the right track. These important aspects of Google Ads testing can greatly help you eliminate inaccuracies and improve your PPC campaigns. Making sure you track all necessary parameters and make smart decisions when choosing your ads. Always remember that just because an ad performs better than the other in A/B testing in terms of CTR, it doesn’t mean it’s more profitable. Don’t skip testing to save time and don’t make assumptions, because they might lead to making crucial mistakes and eat away at your budget, without a return. On the other hand, really think through the customer journey and the overall funnel and how you can test, iterate and optimize in your campaigns to generate the most return possible. If you are unfamiliar with digital marketing or SEO, Google updates and changes their algorithm very often, more often than they even announce. They do two types of updates – small daily algorithm updates and major ones several times per year. Daily algorithm updates – core algorithm updates – generally happen a couple times a day, but are not really reported and there isn’t much info revealed about them. On the other hand, the Broad Core Algorithm Updates happen only few times per year and usually make significant changes in search results for users. These updates are focused on improving the quality of search results and providing the best possible user experience to it’s users. This is really the main difference, creating more relevance, between the two types of updates. What do I do if I’ve noticed Rankings have dropped? Many people have noticed a drop in their key rankings for some search queries. This is due to the fact the update was focused on improving user experience by providing contextual results based on search intent. Just like the update from March, there are no website fixes for those hit by the update. One of the things you can do is identify if there are content pages that are lacking in quality and see if there is a need to overhaul your content strategy or just make some minor updates to it. The key is to remember to tailor it to the search intent of your target audience. Based on our research and findings, we noticed that the focus has shifted from keyword-centric results to topic-based results. This is Google’s way of providing searchers with insightful results answering their search queries, matching search intent more closely. Even Google’s Danny Sullivan stressed the importance of high-quality content in a tweet soon after the official announcement of the algorithm update. First and foremost, take some time to identify the pages that dropped in rankings, how considerable the drop was, and what websites replaced yours. Do an analysis of your previously high-ranking pages and compare them with the ones that took over in rankings. Try to discover what makes the content on those pages better, more relevant and what matchers searcher intent as compared to the content you had that was rankings previously. Keep in mind, just like with any update, Google may roll back a few of the changes and you might have seen some rankings return, I have yet to notice this, but, keep an eye out. Monitor the SERPs carefully while you strategize your new content creation approach. When you do decide to start creating content, make sure you do extensive research! Quality over quantity generally works, but, keep an eye on what Danny mentioned above. Think about your overall content strategy, how the new research you’ve done has made you re-think or want to re-work the content strategy. This doesn’t mean stuffing pages with more content OR drastically re-writing entire sections of your site. Rather be thorough, be thoughtful, and be mindful about the approach and take into account the research you did relating to the sites now rankings for the terms you once were. Featured snippets are short, direct answers that show up on top of Google search results as an answer to a search query. Featured snippets are a result of good on-page content best responding to search engine query. There are three types of featured snipped that can show up in search: paragraph, list, table. Paragraph is the most common type, occupying 82% of snippets. Featured snippets are enticing to marketers because they can easily get you to the #0 position on Google search. This matters because it helps you to prove your relevancy to Google and users that your content is useful, and offers people with quality information. When your content is shown in a featured snippet, you are the top pick, meaning you are beating the competition and out-ranking sites that rank in the top 10 positions for that particular search topic. But the most important reason why marketers love seeing their content featured on top of search results is the increased traffic their websites receive which can go upward of 20-30%. How Do Feature Snippets Affect SEO? Featured snippets are changing the SEO landscape. Over time, Google has added different types of featured snippets, and modified them, but the most striking change has been the increase in the number of search queries that trigger featured snippets. A recent study by Ahrefs, which included around 112 million keywords from their US database, showed that almost 14 million keywords have featured snippets in search results. That means that 12.29% of queries have featured snippets, out of which only 30.9% rank at the very top in organic results. As Google gets better at understanding search queries and delivering featured snippets, it’s most likely that the numbers will continue to grow. It’s also interesting to note that the majority of snippets are triggered by a long-tail keyword. Another interesting finding shows that featured snippets have a negative impact on the first organic search result with fewer clicks to the overall organic search results. When there’s a featured snippet, the first organic result in Google search gets a significant drop in click-through rate. When there is no featured snippet present, the first result gets 26% click-through rate, compared to with the snippet at 19.6%, and the featured snippet itself at 8.6% click-through rate. Are Featured Snippets Good or Bad for SEO? We already established that featured snippets are gaining popularity with Google and stealing organic traffic. But do they have a negative impact on SEO and overall ROI? Not necessarily. Despite the fact that the reduced click-through rates, there are a few things to consider before labeling them “bad for SEO”. People who read featured snippets are not your most valuable audience. This might be subjective, and vary from person to person, but hear this out. If a user is looking for a quick answer to a simple question, chances are they are not interested in reading long-form content or making a purchase. So the traffic you potentially lose isn’t that valuable. You can optimize for feature snippets. If ranking at the top of search starts to lose meaning when there’s a featured snipped above the results, then you need to find your way to the #0 position. The right on-page content optimization can get you that position and get your site included in featured snippets. Brand visibility is still important. Getting a featured snipped doesn’t necessarily mean getting more traffic. Yes, we are aware it’s a bit contradictory to all said above, but it’s true, some people still choose organic results. But the good thing is, you will receive brand exposure and visibility that can increase brand familiarity and increase trust among your audience. There are still 87.7% of queries that function as they always have. Even though there’s an increase in the number of featured snippets and almost one in every eight queries, that’s still a tiny portion of the overall search volume. You can and should still optimize for the 87.7% of queries that still don’t have a featured snippet, allowing you to rank higher and garner more traffic. Winter is Here. Sorry. Featured Snippets are Here. Use Microformatting. First, make sure your site is properly updated according to the microformat standards, which you can find and use on Schema.org. Microformatting will help Google understand the type of information on your site and make it easier for search bots to crawl and parse the information. If your site doesn’t have this formatting, it won’t be considered for featured snippets at all. Offer brief and accurate answers. Once your page is optimized for a search query, you should answer it as briefly and accurately as possible. Users, and more importantly, Google, like to offer answers that are one or two sentences long, so do your best to keep it short and simple. Get inbound links. Link building is an important factor, in organic search, and in featured snippets. Do your best to attract inbound links from quality sources, like you already do. Yes, featured snippets are changing the SEO world. They steal potential traffic from organically ranked sites, but there’s no need to panic. There is still an 87.7% chance that your traffic won’t get poached by a featured snippet. Keep that in mind when you create and adjust your strategy, and optimize for SEO. From where we stand, you have two general options. Consider optimizing your own site to be included in the featured snippets as well, or adjust your strategy to avoid them altogether. We can provide suggestions and recommendations, but it’s up to you to figure out how you want to handle the situation. If you’re a digital marketer, you have probably managed Google AdWords Campaigns a few times or use it on a regular basis. The primary reason we love using Adwords is because of the precision to get down and target searcher intent, to get in front of the right people, not just the most people. If you’ve used AdWords, you know it offers a variety of metrics and reports allowing you to track and analyze your ads and keyword performance in order to optimize your efforts. All you need to do is use the reports wisely to make the most of your campaigns. One of the most important things you need to monitor in AdWords are keywords. By analyzing your keyword performance, you will be able to review which ones are helping you meet your advertising goals for the ads that show up in Google Search Network, and which ones do not. – open the Reports section from the top menu, and then from the Pre-defined reports drop-down menu choose Basic, then select Keywords or Search Terms, depending on what you with to analyze. Both ways offer the same options, including analytics for Keywords, Negative Keywords or Search terms. It’s up to you to decide what data you wish to get, and specify: segments such as date, click type, or device; columns for adding specific types of data you wish to include in the table, and filters for the statistics you’d like to see. All the data you get in the Keywords and Search Terms reports are very useful and allows you to thoroughly analyze and assess your keywords performance and make informed decisions about your ads. At . The segments can show you the performance of search terms match type – whether a broad match, phrase match or exact match search terms triggered your keyword and your ad to show. That way you can compare data about clicks, impressions, CTRs or conversion rates for the specific search terms that have been used and triggered your ad. These statistics will help you find the keywords which have the best performance for a particular search term match type. The columns allow you to add or remove specific types of data you wish to include and analyze. And one very important thing that we strongly advise you to track is Quality Score in Adwords. It is a measurement of the relevancy of your ads, keywords and landing page to your customer. By enabling the Quality Score attribute, you will be able to see the attributed value for each keyword in your campaign, with 1 being the lowest and 10 the highest score. 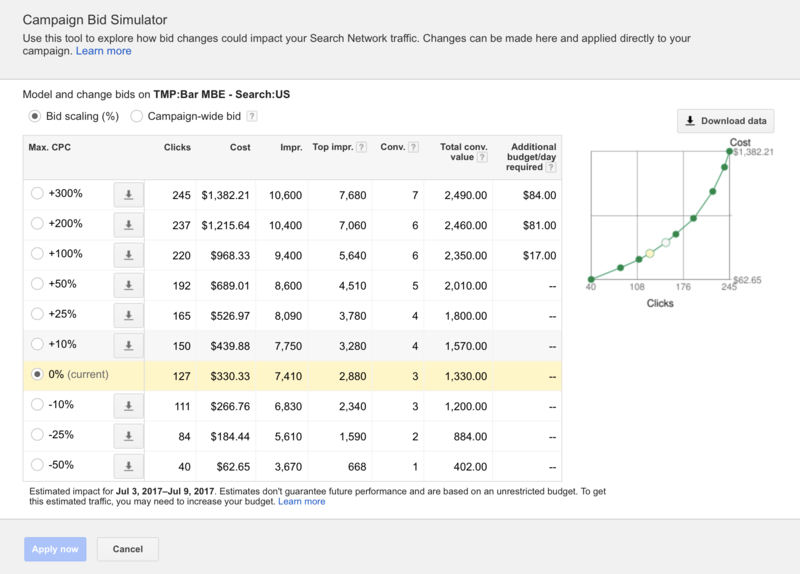 Another important column that you should enable is the adwords bid simulator. It estimates how the keyword bid changes impact your potential weekly Search Network clicks and costs. One more column that is not included in the default view of the report are the First page bid estimates, Top page bid estimates and First position bid estimates. These attributes will show you the approximate CPC bids you need to make to reach the first page, the top of the page or the first as position in Google SERPs when the search term is an exact match for your keyword. These estimates will be calculated based on your Quality score and the existing advertiser competition for the keyword in question. If the calculated estimates are very high, then probably you have a poor keyword Quality Score. By using filters, you can find specific types of data that let you evaluate the performance of the keywords you use. You can use these data to learn which keywords are eligible to trigger ads, and which ones have good ROI. Another great option that AdWords offers is diagnosing the success of a single keyword or multiple keywords at once. By diagnosing one keyword you can learn whether your keyword is showing ads, and what’s it’s Quality Score. If it is showing ads, then it’s a keeper, but it if isn’t, Google will explain why and give you suggestion on how to solve the problem. Furthermore, you can break down the Quality Score and get statistics about your keyword relevance, landing page experience, and landing page loading time. On the other hand, if you wish to diagnose multiple keywords, you will need to answer specific questions about your ad’s visibility. It’s up to you to choose the attributes you wish to text. After you run the test, you will receive results about the status of your keywords. But note that those results are only applicable in the time of testing and if you don’t act quickly, they can very soon become outdated. As I mentioned, AdWords wants you to show your ad to fewer people and actually they reward you for it by using one feature designed specifically for that purpose, Quality Score. One key component of the Quality Score is CTR (Click-Through-Rate) – the percentage of people that click on your ad when they see it. Increasing your CTR and boosting your Quality Score leads to lowering the CPC. And in order to achieve this, you need to carefully track and analyze your ads’ performance, especially your keywords. Make the most of your Keywords report and learn how the keywords you use perform, which bids you need to change, and which keywords you need to remove. Additionally, using the Search Terms report, find out which search queries triggered your ad to be shown and clicked. Don’t be surprised if depending on your keywords matching options, the list of search terms differs from your keywords list. Those results can help you identify successful keywords and phrases that you can(should) add to your keywords list. And if your ad showed for what you consider to be irrelevant search terms, you can always use those phrases as negative keywords. Either way, it’s a win-win situation. All you need to do is explore the available options, and learn from every bit of data and statistic you get. And if anything is unclear, and you are not sure which metrics or attributes to use and track, or what to do next once you received the stats, our expert PPC team can “translate” the data to you, and help you reach your goals. Google’s main goal is to provide the best possible results to a search query. And since most users rely on mobile devices for the majority of their online activities, Google’s focus is on catering to the needs of the ever growing number of mobile users. In the past years, Google has released several updates aimed at making the web better for mobile consumers, but now, it took its game up a notch by rolling out a mobile-first version of its index. There’s no choice for website owners but to adapt to the mobile-trend in order to maintain traffic and ranking because the new index will split the desktop and mobile results, and if your website is not prepared for the change, you could be in for hard times. Mobile will become the primary index and mobile searches will no longer show results for desktop, and vice versa. If you have a desktop and not a mobile version of your site, or different mobile and desktop versions, you should be concerned and address these issues as fast as possible, or before the mobile-first index is fully released. The first step is to create a fully-functional mobile website. Next comes SEO in a mobile-first index. Let’s take a look at what you can do to improve your mobile website’s SEO. But to make things easier, and so you don’t have to do everything on your smartphone, open your website in a desktop browser and view the mobile version. You can do this by right-clicking on the site, and choosing the “inspect” option, then, you can toggle between desktop and mobile in the upper left corner of the menu. First of all, you need to check if your website can pass the Google Mobile Friendliness Test. Begin with your key navigation pages, and your highest selling category and product pages, one by one. Take a look at the “No Mobile Configuration” section to see which pages you need to focus on first. If you still don’t have a mobile site, responsive site or AMP pages, start implementing them right away. Or, if you can, go for a responsive website design. But remember, pages without mobile optimization can badly impact your performance in the SERP. You’ll have to do this check on a smartphone. And to make sure Google is indexing your mobile pages, open Google and in the search box type: “site:visiblefactors.com”. If there are no results for your site, Googlebot may be unable to access the mobile pages. If you are using separate mobile and desktop site, and Googlebot is not indexing your mobile pages, we recommend you create and submit a mobile sitemap. Tag the mobile pages with the rel=canonical and rel=alternate tags. Googlebot might not be indexing mobile pages because of the separate mobile and desktop URLs, but this should do the trick. But, if you don’t have separate URLs, double-check the robot.txt file and make sure you are not blocking Googlebot. For this step, go to Google Search Console, Crawl Errors, and choose Smartphone. The errors you identify here can help guide your strategy. Analyze each error and deal with it in the right manner. One common mistake that shows up frequently though, is a faulty redirect. Make sure you have matching smartphone and desktop URLs, so users (and Googlebot) get sent to the right page. When you fix the smartphone errors you allow Google to index your content better. Mobile and desktop on-site optimization differ. For example, title tags on mobile are shorted than those on desktop. Keep in mind that you need to create good user experience, and that includes good on-site optimization, from title tags, to headers. The simplest way to address this issue is by using Screaming Frog. Run the check, then go over the “Page Titles” mane at the top. Get all results for “Over 65 Characters”, and download the data. Rewrite the longer meta titles, and repeat the same procedure for meta descriptions as well. Make sure all of them are shorter and mobile friendly. And for the headings, you can opt for slightly reducing the size for a better mobile UX. Also, run a check with Google’s robot.txt testing tool to make sure you are not blocking Googlebot. Mobile page load speed can be a crucial UX factor, and load times longer than 4 seconds can make visitors leave. To test your page load times, you can use a lot of free tools, like PageSpeed Insights and Pingdom. Just open your website and run the speed test. Depending on the result, there might be several things to consider. But the simplest optimization you can do, without help from a development team, is optimizing image size. Next, if that doesn’t help much, have your dev team reduce code, add browser cache, manage plug-ins. And lastly, see if your web designer can move more content above the fold. In order to cross-check and compare your mobile and desktop website, you will have to do it manually. Pull up a list of your most visited and highest performing pages from Google Analytics, then open each page, one by one on desktop and your smartphone. Also, check and scan your code for any inconsistencies. If you find pages with more content on desktop than the mobile version or vice versa, go over them with your editorial and development team to redesign them. It’s advisable to have a completed content audit before you do this so you’ll know what content can and can’t be removed, without hurting traffic. To make sure Google sees your web pages the same way you and your users do, use Google Search Console’s Fetch and Render, and choose mobile user agent from the menu. That way you’ll get to see two pages, side-by-side, and you’ll know whether your content looks the same to Googlebot and your users. Remember that Google ranks content only from the mobile site, and uses the canonical links as guides for users searching from desktop or mobile. So be careful when you making the redesign. While many webmasters skip adding structured data to mobile sites, in the mobile-first index, if you want to keep it, you’ll have to add it to the mobile pages manually. If you already have a responsive website, then your schema should do it. But if you have separate mobile and desktop sites with different URLs, you will have to make sure you followed all the necessary steps for mobile, as you would for your desktop site. Double-check with the Google Structured Testing Tool if your schema markup has been added correctly to your mobile site. Use the “Inspect” function to make sure it’s coming up on mobile devices. Make sure to update all URLs you use in the schema, but be careful not to drown your site in structured data. And if you use a plugin for structured data, use a testing tool to make sure the displayed markup is correct. If you still didn’t have a chance to create mobile pages for your website, then create AMP versions of your pages – it’s the easiest way to get Google to index them. But if you have a m.mobile site, and the content of your AMP page is full and different from the one on the m.mobile site, Google will rank he m.mobile site above your AMP page, and you won’t rank for the keywords included in the full content. Also, you can’t rank higher if you have a mobile version and an AMP version of a page. Google will rank the desktop version of the page instead. If you set up AMP pages, you can easily check them on your smartphone by trying to open a specific page from your website. If you see the small AMP symbol – the gray lightning bolt next to the result, you’re good. You can also do a check-up on your desktop, by viewing the source and searching for rel=”amphtml” or by using the AMP Chrome extension in order to switch between the regular and the AMP versions. And in order to do a final check on whether you implemented AMP pages correctly and get suggestions on how to fix any problems you might have, use the AMP testing tool. If you already have a responsive website, then skip this part 🙂 But if your website uses subdomains such as m.visibleactors.com or visiblefactorsmobile.com, than you need to verify them in Google Search Console. First, open your Google Search Console account and click the “Add Property” button, and add your subdomains. Next, after you upload your subdomains, Google will send you notifications about your mobile site to let you know if you have smartphone errors, manual actions, if you’re blocking Googlebot, or basically if there are any issues with your site. Beware that Google treats subdomains as separate sites so pay attention to all notifications you receive and make sure to fix all problems. The challenges for SEO-teams become even greater when you need to adapt your SEO-efforts to the upcoming mobile-first index and prepare your website for the upcoming change as fast as you can. And maintaining a dedicated mobile site, if you still don’t have a responsive one, is vital if you want to stay afloat in the mobile-first index, at least for the time being. The rollout will be global, and all websites will face the same constrictions, there’s no escape. So make sure to be prepared when it happens. It’s hard being a start-up. At the dawn of their lifecycle, startups have to keep up a steady growth of 30% every year or suffer a painful death. Up until a while ago, “growth hacking” was an odd buzzword on the lips of SEOs and marketing professionals alike. Today, it has become a synonym for most of the marketing tactics used by startups; a process of experimenting across marketing channels in order to identify the most effective and efficient ways to grow your business. It is a mindset; a fast-paced, data-driven and actionable approach to help you capitalize on the opportunities and ideas that drive business growth. The man who coined the term, Sean Ellis, defines it by stating that start-up companies need to change the rules of conventional channels, or better yet, innovate outside of them since they are beyond the advantage of adapting to the old rules of marketing. Young startups need to be creative and test new ideas relentlessly because, if they don’t, they will be soon out of business. This one is the simplest – Click to Tweet helps you promote your products on Twitter. Engage your Twitter followers in sharing your product and you can offer them reward like coupons. The built-in analytics will tell you how many times your link has been clicked, which is as useful as ever. Just sign in with Twitter! The automation on Jooicer makes life on Twitter for the baby start-up a charm: you can select the actions you want to be automated by creating “recipes”: say, “follow all users with a certain hashtag in their bio”. You can create your own custom recipes or share with others. Out of the nifty little bundle of tools called SumoMe, the ListBuilder lets you convert one-time visitors into subscribers. You can either use the completely customizable popover after visitors spend a certain amount of time on your site or turn on smart mode so that the tool can ask them to subscribe when they’re ready to leave the site. Similar to the ListBuilder, you can customize a pop-up to appear after the visitor has scrolled down a specific percentage of your site. That way you can be sure that they have had the time to enjoy some of your content before committing. This is the hottest way to turn visitors into leads – by rewarding them with downloadable content like brochures or PDF documents. The button is free for you to place anywhere on the page; all you have to do is create the bonuses to lure those leads! Sharing made easy! All your visitors have to do is highlight any piece of content they wish to share and they can send it to their Twitter feed with the click of the mouse. A must-have plug-in that makes it easy for your readers to share an image from your blog posts. This comes supported with the fact that shares on Facebook get over 39% more engagement if they include an image. It’s very user-friendly: all the photos in your posts will be overlaid with sharing icons for the social platforms and each share includes a link as well. Much like the ListBuilder and the ScrollBox, Optimonk allows you to detect “exit intent” and add a pop-up message asking your visitor to extend their stay or sign up for more. They offer a free 14-day trial, after which you will have to inquire for the rates. With this free little tool, you just type any term in its search bar and it lists you all the popular articles on that particular topic. Work wonders for writers who want to be at the top of their writing game by staying relevant! HelloBar is not new, but it’s still not very well known. It adds a notification bar on the top of your site that doesn’t move and you can stick any kind of action you want on it, from email collection to a simple message! The basic plan is free, but with the PRO you can do some cool things like A/B testing. With SessionCam, you can watch a recording of your web and mobile visitors in order to identify potential problems or simply increase conversion. It also shows you heat maps and helps you build conversion funnels between the pages on your site. It’s free for the Basic Plan. Improve your conversions by finding out where your visitors like to click on your site. You can even analyze the performance of the forms you want to be filled in. ClickTale records individual visitor sessions on both desktop and mobile and aggregates it all while allowing you to focus on a particular individual. This one’s also a no-brainer: If you have an ad that is related to the story you wish to share, use Snip.ly to increase conversions. It’s free up to 100 conversions; if you want to beef it up, plans start at $16 for 500 conversions, up to $85 for 5000 conversions. Make all your lead generating tools interactive and fun with Typeform and watch as the number of leads increases! As many other tools on this list, they offer a basic plan for free to try it out. The last one on our list makes the coveted email marketing a breeze. No matter if it’s a thank-you email for a visitor signing up or an apology for when their session was rudely interrupted by an error, MailGun is the API for you! And it holds a sweet pricing plan: free up to 10,000 emails/mo, then it’s $0.00050 per email. It may be difficult to grow your business from the ground up, but it’s a fun and exciting challenge. One that can be made a lot easier once you find the right growth marketing tools that will ease many tasks. Try out some of the 15 on this list and let us know how you liked them. And if you need more suggestions, or additional growth marketing help and advice, don’t hesitate to contact Visible Factors. We’ve been where you are. If you are actively using Google AdWords, then you know that Dynamic Search Ads (DSA) are the easiest way to reach customers that precisely match your offer on Google. The best thing about DSA is that they use your website to help target your ads and fill in the keyword-based gaps in your campaigns. Even the best managed AdWords accounts that use many keywords can experience some setbacks without DSA, including missing out on relevant searches, experiencing delays in writing ads for new products, or being out of sync with what’s actually available on the destination website. The benefits of using DSA are great. They help you save time and reach new markets faster and the ads are frequently and automatically updated as soon as you make changes to your webpages. They also show relevant results with dynamic headlines, giving you greater control over your campaign, and most importantly, helping you generate additional traffic and sales compared to what you get from keyword-targeted campaigns. Now, Google is making an update to DSA by introducing three significant changes aimed at giving advertisers a better handle on the quality of the ad creativity and targeting. Let’s see what those changes actually are. Searchers are more likely to click on an ad and buy a product or service when it fits their needs or solves a problem. That is why having more control over what you advertise, and making sure your ads are very relevant to prospects is key. In order to provide advertisers with an additional layer of control, Google introduced Page Feeds to DSA campaigns. That allows you to create a feed – a spreadsheet of the products or services you want to promote, and add it to a new or an existing dynamic search campaign. When you use a Page Feed to specify which URLs to use in your DSA, it helps Google determine when and to whom to show your ads, and where to direct people on your website. Additionally, Google recommends adding custom labels to your selected URLs to categorize and organize the specific targets in groups. When you use labels such as “Special Promotion” or “Out of Stock” in your Page Feed, you can easily activate ads within that promotion at the same time, or pause them to stop unwanted paid traffic. This is a very helpful feature that saves time and helps ecommerce advertisers save money by delivering only relevant content to their prospects. Having more screen real-estate is always good when it comes to display advertising. You want your ads to be bigger and more noticeable, and also explain your offer better and in more detail. The transition to Extended Text Ads on Search and Display campaigns occurred in January, and these new, larger ads are about to make their way to DSA as well. Longer headlines and descriptions allow advertisers to show more information about their business and their offering. The higher character count of the extended description field gives you additional space and lets you be more specific with the ad, while the other features remain dynamic. This enhancement is expected to roll out over this month (May 2017) and we are excited to welcome it. Ad relevancy and quality may begin with specifying which web pages and which products or services you want to promote, but it continues with having your ads show only when they are most relevant to the what the searchers are looking for. Let’s say someone looks for a digital marketing agency in L.A. and instead of seeing the ad for Visible Factors, they are shown an ad about a digital marketing agency in Charlotte. Not very relevant, right? With the latest updates, Google is promising advertisers a quality enhancement focused on location-based targeting. Improved ad-targeting is very important and beneficial, especially for local businesses that want to reach a certain audience. When you know that your ad will be displayed to prospects which are in the vicinity of your business, you are willing to pay more, because you will get exposure and possibly more clicks and an increase in profit. These three changes made to Dynamic Search Ads are allowing more control over your targeting and more specific descriptions of the products and services you are selling. This means your ads are about to have a higher conversion rate at lower CPA (Cost Per Action). So if you were hesitant about including DSA in your campaigns and weren’t sure if they’ll get you the wanted results, we hope these improvements change your mind and make you give DSA a chance. If you do, give us a call to help you set up your campaigns. We promise you’ll be in for an awesome and very fruitful ride. How to Make Your Textual Content SEO-friendly? Whether you are writing content for your company website or the next company blog post, the goal is to create great content that offers value to the reader, while positively reflecting your brand. But at the same time, you want your content piece to be search engine optimized. Let’s face it; great content is not useful if nobody can find it. The goal to write a great blog post that is SEO-optimized while attracting an audience can seem contradictory. But if you have great writing skills, it is easy to create content that can accomplish both objectives. Generally speaking, writing valuable content is one of the best ways to optimize it for SEO and there are no tricks that can compete with the raw power of high-quality content. That being said, even the best content can use a few structural tweaks and tricks to make it even more SEO-friendly. If you want to be optimized for SEO and easily discoverable/sharable, here are some universal guidelines that you should stick to when creating your next piece of textual content (supposing you already did your keyword research). First things first – your headline is the first thing anyone sees and reads. If your content is valuable, but your headline is mediocre, your click-through-rate will be low. Before writing your blog post body, write your headline. It should be clear and concise, conveying a specific message or idea that attracts people’s attention and prompts them to click and read further. A good practice is including your main keyword in the headline. Adding numbers is also an effective way to make the headline more enticing and clickable. Subheadings are an important part of you blog post’s body because they make the text scannable. Most people read the headline and subheads first, then decide whether to read the whole text or only the parts that matter to them the most. Also, subheads are another way to strategically use your keywords and increase keywords saturation. When you prepare the blog post for publishing, make sure to add suitable HTML tags (H1, H2, H3…) to your heading and subheads in order to optimize the post for search bots too. If you created your headline, and are ready to move to writing the body, start by writing a short outline of the text. Think about the purpose, target audience, and the main action you want the reader to take at the end of the text. When writing the outline, you can write the subheadings first. That will give you an overview of what you need to write in each section. Once you start the actual writing, pay attention to the quality, originality and the structure of the text. Always write unique content. Plagiarism can only hurt your ranking with Google, and the trust and authority you built among your audience. Use storytelling principles to improve the content quality and try to connect with readers on an emotional level. Use short sentences and short paragraphs, no more than 100 words, to improve the readability and the blog post structure. Smaller chunks of text are easier to read. When you want to specify or highlight and list certain points, use bullets or numbering to emphasize their importance and separate them from the general text. That will also help readers scan the text easier. Be careful with the keywords used throughout the body. Use the main keywords and synonyms in moderation. And try to use signal words like “first of all’, “second” and “finally”. And conjunctions “surely”, “consequently”, “for this reason”, because they will improve the structure of your text, and the reader will get clear signals about what follows. The minimum length of your blog posts should be 300 words. Even though Google likes long articles, and sometimes ranks them better, readers often are scared away by posts that are over 1000 words long. The ideal article length is somewhere between 600 and 800 words, depending on the topic, the target readers, and the goal of the blog post. For example, in-depth guides may require 3000 words or more. As a general rule of thumb: the ideal keyword density is about 1-2% of your text. So, in a 600-word post, you should mention your keyword 6 to 12 times. Do not stuff your blog post with keywords because instead of making your content more SEO-friendly, it will only hurt your ranking. Page links are the main building blocks of your webpage. Your link structure is important to Google. Links tell Google if your content is valuable to people, and you are connected and sociable. Adding links to high-quality, reputable websites also improves the validity of your website, and your ranking. And using credible sources in the body of your text is also a good way to create trust with your readers. If you have other posts closely related to your current one, link back to them. It will make the post stronger because it will show more authority on the subject. But whether you link to internal or external pages, use appropriate anchor text which flows naturally with the rest of the content. Another important part of on-page SEO optimization is writing your meta description. Use the meta descriptions to guide the search engine, and help it understand what your content is about. It is the HTML attribute that provides search engines with a concise explanation of your page’s content. The meta description should be enclosed in the <head> section on your webpage. But meta descriptions help searchers understand what your content is about too. The text in a meta description is what Google uses as a snippet when your web page shows in the SERP. And that copy, along with your headline, will determine whether the searcher will click on your page or not. So use those 150 – 160 characters wisely, and make sure to incorporate your main keyword as well. Visuals make textual content more interesting and shareable. People are more likely to share the content if there’s a fun or unusual image included. And if it a sales-related text, people will be more likely to buy if they can see the product featured in attractive and relevant photo. But images are important and should be optimized for search bots too. So make sure you enter text in the title and alt tag fields, and preferably use your keyword too. Optimize the photo dimensions and size. It’s a good practice to match the image dimensions (width) with that of your web page template and use browser resizing capabilities to make the images responsive by setting a fixed width and auto-height. Try to use smaller files because large files load slowly and that can hurt SEO. Make the images slow, but don’t compromise their quality and visibility. There are no special tricks on how to write great content. Nor are there tricks on how to rank high in Google if your content is average. Remember to always write for people, and don’t underestimate the importance of SEO-optimization. High-quality, original content is what matters the most, but it takes a little extra effort to additionally optimize it for SEO and rank highly for SERPs, clicks, reads, likes and social shares. It may be difficult at first, but it’s very much possible to achieve both goals. Then again, if you believe that it’s a job best handled by the pros, you are welcome to drop us a line or give us a call, and we’ll make sure your brand’s name and story take off.